"Foul play! ", called a fish-eagle. "You frightful fiend! ", fussed the finches and flycatchers. Zettelwitz had ruffled a few feathers by transforming Iris in front of her family and friends. He was suddenly surrounded by a flock of furious birds, flapping and fluttering everywhere! 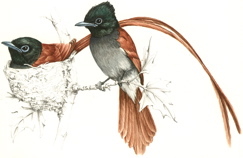 They flew all around his head and fetched him so many thumps with their wings that the feathers flew. "You want to fight?" the falcons screeched. "We'll fix you!" Kalinko called his dogs: "Franzi, Domino, Wotan! We've found him!" The dogs all fell on the wizard: woof, woof, woof! "Take that, you ruffian", Kalinko hissed and knocked his foe to the ground with a fist. But Zettelwitz picked himself up and fled. In his flight he fiddled with his magic wand and fussed under his breath. A fence of flickering flames flared up to stop anyone from following him. The wind fanned the flames and they set the birdhouse alight! Befuddled, the animals could only watch as it turned into a fiery furnace. "Confound it! Fetch some water! ", shouted the king, running past with a fire-hose. The animals all followed his example. They finally managed to stifle the fire with a flood of water. Only a few flames were still flickering. "If I fantasize a little, I can see an F here", thought the fanatical wizard, pointing his wand forward. Piffle, fiffle, faff and fiddle! Flame, become an F! A FEARFUL PUFFING FILLED THE AIR! A FANTASTIC FLASH! 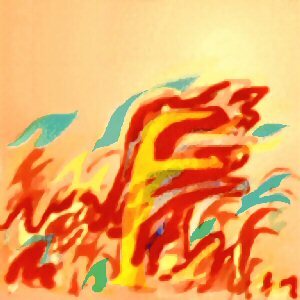 The flame was transformed into a fiery F! "Nineteen fabulous letters", wispered the wizard." Only seven to follow".